Many tumor cells produce peptide antigens. These may be released in the bloodstream or remain on the cell surface. Certain peptide antigens have been found to be associated with specific human cancers, such as malignant melanoma, renal cell carcinoma, breast carcinoma, prostate cancer, lung carcinoma, and colon cancer. Tumor antigens can be classified into two categories based on their pattern of expression: tumor-specific antigens (TSA) and tumor-associated antigens (TAA). Tumor-associated antigens (TAAs) are mostly restricted to tumor cells, whereas tumor-specific antigens (TSAs) are unique to tumor cells. Tumor-specific antigens include all proteins produced a tumor cells that have abnormal structures due to mutations of the concerned protooncogenes or tumor suppressor genes that caused the tumor in the first place. In contrast, the mutation of genes unrelated to the tumor formation may also lead to the synthesis of abnormal proteins. These proteins are called tumor-associated antigens because they may also be present in some normal cells. An increasing number of TAAs have been identified in cancer patients as the targets of T cells and some are being tested in clinical trials. 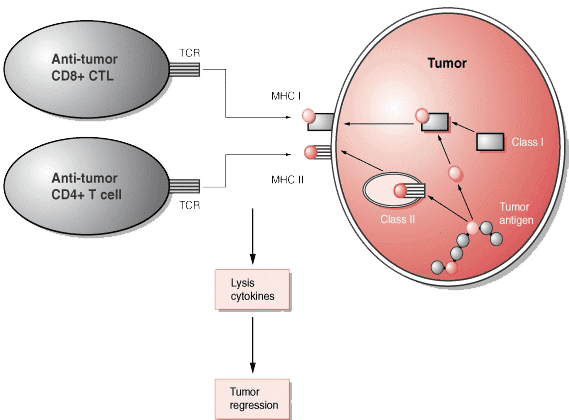 Cytotoxic T cells (CTL) can recognize small peptides (8-10 amino acids long) that have been processed from larger proteins from tumor cells. These peptides are presented to the cytotoxic T cells in the peptide-binding clefts of MHC class I molecules on the surfaces of the tumor cells. CD4+ T cells can also recognize slightly longer peptides (12-18 amino acids), which are most likely derived from larger proteins expressed or secreted by tumor cells. These are also processed and presented in association with MHC class II molecules. These peptides may be derived from any proteins synthesized by the tumor cell (proteins found in the nucleus, cytoplasm, lysosome, or plasma membrane and proteins that are secreted). LifeTein can customize a discovery and development path to fit your exact needs for peptide synthesis. American Made Peptides/Services Made in USA🇺🇸.